No, the course is not groomed (except for a few kilometres in the ski trails between the Chalet and Back Bay). This is a trail run/ski adventure event and not a loppet. There are actually 2 road crossings where racers will need to remove their skis and cross a double lane, paved road. Is there a mandatory gear check? Yes. There will be a gear check prior to the event, and random checks for relay team members at the staging points. Each staging point will have water. If you want food or a change of clothes, it is your responsibility to have someone drop these off for you at the checkpoint. All checkpoints will be road-accessible. How do relay members get to a checkpoint? There are currently no shuttle services to or from check points. Racers are responsible for getting to check points and are responsible for their own transportation back to town. Car pooling with other racers, volunteers or media is the best option. What is the temperature cut-off? 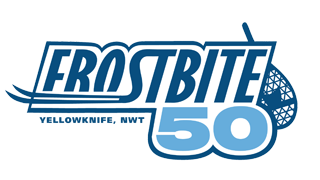 The Frostbite organizers will meet the evening before the event and the day of the event to decide event restrictions or cancellations due to weather. The race organisers will make every effort to run the event but, in the event cancellations in necessary due to weather or other participant safety concerns, entry fees cannot be refunded as the funds will already be committed by race day. What happened to the Frostbite 45 and what’s different? Everyone told us it was too easy, and it was time to kick it up a notch. And the route was actually closer to 50 km anyway. The only difference is an additional short loop in the Ski Club trails at the start and finish. Besides “Frostbite 50” has a better ring to it! Any advice for folks visiting Yellowknife for the first time? Check out visityellowknife.com for accommodations and other things to see and do in Yellowknife. The Explorer Hotel and Chateau Nova are the closest to the Ski Club, downtown, and to the museum (www.pwnhc.ca).